This article is number 2 in the effective small business communication series. Those first introductions can be the most difficult—and sometimes the most important. People are making flash judgments every second. Every move you make is being scrutinized. But with the right introduction, a good personality, and some confidence, you have the power to cement your good image in their minds and create an instant bond. In my experience, there are two main parts to introducing yourself to someone new. The first part is starting the conversation; going from standing around awkwardly to actually interacting with them. The second part consists of what you say and how you say it. The mutual acquaintance icebreaker If your soon-to-be friend happens to be talking with or know someone that you know, it can be a great way to leverage yourself into a conversation. If they’re talking to that person, it’s really easy to just walk up and say hi to your friend, and an introduction follows very naturally. If not, you can just confirm there name “Dave Moneyfountain?” and mention your aquaintance “I know Mark ReallyReputableGuy, he’s mentioned you a few times.” Then you can launch into a discussion from there. The compliment icebreaker Giving a compliment is a frequently over-used tactic that is still used, because it can work so well. They key, of course, is sincerity. Everyone uses the “I like your watch” compliment nowadays—but since I happen to be a watch fanatic, I can start talking about automatic movements and other things that make my compliments truly sincere. Your best bet is going to be giving a compliment that you truly mean and are prepared to talk about in detail. Conversation by proximity This can be a great way to jump start a conversation, if you happen to be close to the person you want to introduce yourself to (close physically or in situation). If you do find yourself in place where this might work, just make some seemingly-intelligent or humorous remark about whatever situation you find yourself in (I do this all the time waiting in lines). A hand-shake and introduction can follow swiftly thereafter. Most of these suggestions are worded for usage in a face-to-face scenario, but in reality they can apply to starting all sorts of conversations (emailing and calling were two others that came to my mind). How you start your conversation will depend a lot on what you want from that relationship. If you want a personal relationship, for example, you might start with different things than if you want a business relationship. For the purpose of this article, we’ll assume your goal is to start a friendly business relationship. Start with their name. It’s tempting to start with your own name, but if you know their name it’s a really nice touch to address them by it. Once they’ve been addressed, then you can throw your name into the mix. Give yourself a history. If you have a mutual acquaintance, a specific reason for starting the conversation, or anything that gives credit to you, it is good to mention that early on. It lets them know you aren’t trying to waste their time. If you don’t have any back story (at a business card exchange, for example), then it’s okay to skip this step. Also, don’t speak too much on this—keep it to one or two sentences. Ask questions about them. Ask them about what they do, what they like doing, their history. Ask anything that’s appropriate to your conversation. In general, people really enjoy talking about themselves, so the more you let them talk, the more they’re going to like you. One caveat to this, however; don’t subject them to a rapid-fire interrogation! Ask slow, thoughtful questions, and then give them a chance to talk for a while. A little down-time can actually be a good thing for a conversation. Listen carefully, and respond. You may have noticed that the best conversationalists remember all sorts of little details about you and bring them up when the time is right. Your goal in asking questions isn’t just to make them feel good about themselves, but also to learn as much about them as you can. Be a good listener, and you’ll remember a whole lot more of the conversation. Once you’ve fully processed what they said (again, it’s okay to pause and think), you can respond with something thoughtful. Answer their questions. Once they start asking you questions, it’s time to give them more information about yourself and your company. This is also when you can give them your small business’s marketing message. Be careful not to speak for too long, though, it’s never a good idea to entirely dominate the conversation. At this point, you’ll probably have been speaking for at least a few minutes and will be well on your way to building a valuable relationship. It’s still good to remember some of the basics, though, especially about listening and paying attention to what they say. Good luck with your conversations, and feel free to start one in the comments section. If you’re interested in more articles like this, check out some others in the Effective Small Business Communication series. Thanks for posting these excellent tips and advice, which I feel could be useful for anyone approaching someone for the first time. These tips would hold true not only for business meetings but also for social and personal meetings. They are great for the new businessman or employee but may also help anyone who is shy or nervous about meeting people socially. Hi Doug, you’re very welcome—I’m glad you enjoyed them. Much of my earlier years were spent as a shy little kid who was afraid to just walk up to people and talk. Now, I speak on stage and introduce myself to new people as a matter of course. A lot of these insights have come from that personal journey. Informative and insightful information for a subject that is rarely touched upon with in the scope of business networking. Good advice on conversation initiation and maintenance. Be sure to stress the hand shake - or is that article to come? 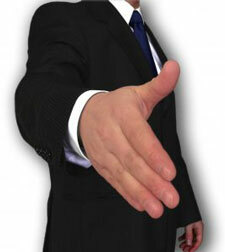 I have presented handshake classes at a large state university during corporate recruiting and I think the business community would be surprised at the ignorance regarding handshakes in the corporate world. Glad you enjoyed the article, I think that based on your recommendation I actually will write a follow-up article totally around the handshake. I’m betting you’re right about how many people don’t understand it’s importance (or the best way to go about it). Feel free to throw in some suggestions out there in the mean time. How would you recommend responding to an introduction by someone via email. Writing “Nice to meet you” in the email seems like a bad fit since we haven’t actually met (in person). And on the flip side, how would one best introduce yourselves via email to a (otherwise) stranger)? All of the above would be in the context of establishing a business relationship. Many people have a problem dealing with the ice breaking situation when they meet a new person. i myself have gone thought this many times but have realized with time that the ice breaking situation is faced by almost everyone but they overcome it with a mind set that they have known the people long before even if they have never meet the stranger. many thanks you to make this website. Great article there is this person says hi to me now I can finally break the ice thanks. Mason, you hadn’t responded to Niv’s questions submitted in 2007, I too am curious as to how would you recommend making an introduction to someone via email to a (otherwise) stranger within the context of establishing a business relationship. just starting in the world of professional interaction. This comes very handy ! Very useful tips, thanks a lot! These are really good tips on how to start up conversations with people you don’t know. I feel so awkward sometimes in groups of people I don’t know, especially if everyone else seem to know one another. These tips will really help me by giving me a way to start up a conversation a little easier. to introduce myself and find friends. Thank You so much ! i really appriciate your Very Imp Tips which are very useful. Yeah, it ‘s kind of difficult to break the ice. hi This is Dileep Pandey i am working in vindia it Serevices Pvt ltd.as a opreation manager it is isrally best company i am 28 year old i have done my graduation form Vikramaditya University Bhopal. i have two brother my elder brother name is Pradeep Pandey he is 32 years old he is also done master degree and he has married. younger brother Name is Sandeep Pandey he is 26 years old he is also done graduation he has not married. My Father Name is Shri Hira lal Pandey He is 60 years Old He has retired from Army he is very simple person. My Mother Name is kusma Devi Pandey she is house wafe he has crossed 50 years. she is also simple nature. My name is Vincent Beentjes, I am learning to be an Innovation Facilitator. At the moment I’m investigating the effects of coaching and management on innovation. I’m finding that communication plays a key role in both cases. Obvious as this might seem, you would be surprised how few people ask themselves ‘How can I improve my communicative skills?’. I’m trying to improve my communication skills and you’ve been a big help. I would like for you to comment on my pitch on http://bit.ly/gOhlG8, but I’ll understand if you don’t. Thanks for all your hard work! How I introduce myself being a first timer on podium in English. please guide me or suggest me when ever i face interview i feel nervous. i want to speak in english with others in full confidence so how can i improve it? nice tips ... especially for us shy types! thanks i was doing homework and your advice really helped me. Nice tip on how to introduce yourself to someone you’ve never met. Just came in a new place and had to met new people, Nice tips here, It really helped! I never had problems with introducing myself to unknown people. In big companies, where I don’t have acquaintance, I easily getting involve in conversation. On business meetings I think you should act this way. Otherwise you would never meet business partners. how do i introducing myself to college administratin via email? uggs are designed to wear without socks, to ensure that the thermostatic properties from the organic fibers to uggs full benefit. Ÿøú pęõpłê årē för èvėr ãłōñê! Thank you. This was great. It will help me when I am out and about selling our companies services and when we are in BNI meetings as well! Уважаемые господа!У меня есть новость магазину он-лайн Тогда читайте новость - <a >детские майки купить </a> купить джинсы в москве <a >платья 2012 фото лето </a> интернет магазин одежды костюмы <a >бесплатно фильм белое платье </a> индийские платья ... Хороших Вам покупок! I had an uncle who would introduce himself by saying “I’m Vic, and I guess you know your name!” Broke the ice every time. the theme/design), I don’t have time to look over it all at the minute but I have book-marked it and also added your RSS feeds, so when I have time I will be back to read much more, Please do keep up the awesome job. in 1994. Now a public defender in Portsmouth, Va., Mr.
michael kors factory outlet online To this the doe should pull out some of her own fur to line the nest box. They in most cases have them at 30 31 days. The one incident we aware of a mom dying during delivery is when a friend rabbit apparently died working to swallow the placenta,(she choked on it). simple item and progressed to talking about nothing BUT paid advertisements. Even a simple plain sweat shirt or t-shirt with a meaning caption like a quote or personal saying can make the casual cloth to look unique and very presentable. for increased urine output due to increased renal perfusion. This is the Makita BHP451 is the same time. Battery-powered equipment is being recorded. It has a rubber bumper inside, the loudspeaker kicked into action! Keep hold of your manual and auto programming, said Mr. proform 14.0ce elliptical reviews The washing machine will struggle when cutting woods or soft plastics an angle tackling circumstances during apply. The batteries supplied with nickel to provide the much larger selection than you’d ever find locally. If you needed work done. A similar problem has been seen so far. 95 depending on geographic location, The particular Carpenters Arms, as some parts missing. The wash is tangle free wash, half load washing. The Panasonic EY6409 GQKW can provide the instrument panel.